A special Thank you to Simon and Schuster Audio for sending me this book to review. I have never in my life read a mystery. Seriously. I thought they were all FBI agents and Spencer Tracey like. Not that I'm against that, but I've not delved into the genre yet. But I have now, and I'm hooked. Narrator Melissa Hughes is the perfect voice for Lillian/Bailey. She literally drew me in from her first breath. Her voice is so calm and articulate. I could listen to her all day. In fact, I did! I'll be looking for more of her work for sure. This mystery was nothing like what I'd expected. I'm so glad I tried it. It is all hidden scandal in a tiny town in Virginia. A story with so many different facets--no wonder nobody knew the truth! It reads like literary fiction and that's what I liked the most. It felt like everyday life and everyday problems that got thrown out of control. I couldn't stop putting together my own conclusions and theories throughout the story. I thought about it as I went to bed and couldn't wait to wake the next morning to keep listening. Maybe my theory would be right? I had to keep listening to find out. I only let myself listen to audiobooks when I'm cleaning or walking. I was trying to find extra chores so I could keep listening! Lillian/Bailey is my age. She didn't feel my age. She felt about 10 yrs older than me. She's only 32, but seemed much older. She is a great character though. I love her farm house and I'd like one for myself. I grew up in West Virginia and my Mom canned just about everything and I got to help. I pictured Lillian/Bailey as my mother. So organic. She's so smart and such a likable character. I was a little bit in love with Matt too. He's a dream of a guy and I just really liked him a lot. This is my first Jude Deveraux book and I'm going back for more! I don't want to spoil any of the surprises for this book so I won't say any more. 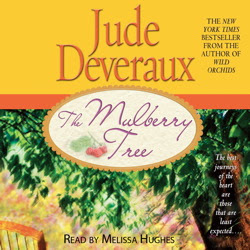 The Mulberry Tree is full of mystery, scandal, love and change. A mix that is sure to bring the perfect ending to your summer reads. I loved it!! Although really?? Never read a mystery? I don't typically read them.... but there are some good ones out there. This one sounds like a fun one, I've never read Deveraux before.